Are you looking for a round bale feeder that will save your hay without breaking the bank? SMALL $89.95 +(S&H) LARGE $94.95+(S&H) XLARGE $99.95 +(S&H) Please allow 2-4wks for delivery. Made to withstand the harsh winter weather. Tough, durable, rot and stain resistant woven polypropylene with 2 years of UV protection. Special loose weave so air and water can pass through. Removes the risk of leg and neck injuries that can be caused by metal feeders. Saves you money every time you feed! The Big Bale Buddy ensures that almost all your hay gets eaten. Feeding large bales without a feeder can waste up to 1/3 of the bale. Lightweight, easy to use, easy to care for and affordable. 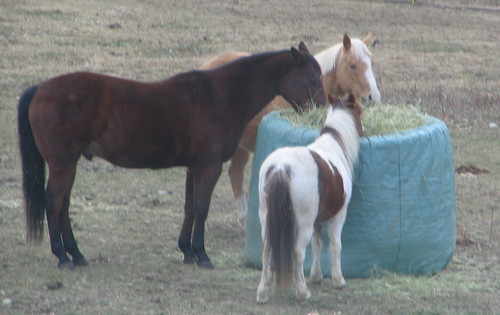 A safe, affordable alternative to pen type feeders; ideal for feeding large round bales to horses, cattle, llamas. bison, deer and elk. The Big Bale Buddy is a new concept in round bale feeders. It is available in two sizes, the small fits bales 4 feet to 4 feet 5 inches, and the large fits bales 4 feet 9 inches to 5 feet 3 inches, XLarge fits bales up to 6ft. 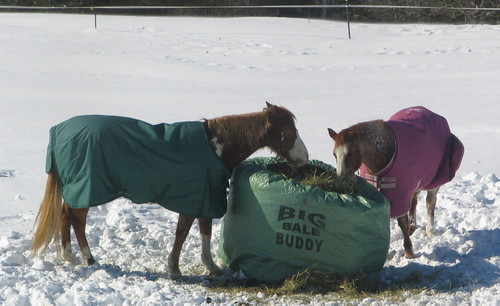 The Big Bale Buddy works best if it fits snugly, so please make sure you order the appropriate size for your bales. It is designed to fit snugly around the hay bale, only allowing access from the top, keeping your hay contained until your livestock eat it. Weighing less than five pounds, it is lightweight and easy to carry. The bag is constructed of heavy-duty, 1500 denier polypropylene, woven so that air and water can easily pass through. Polypropylene (the toughest plastic made) is a naturally rot and stain resistant material and the 1200 hours (2 years) of integral UV protection keep it from breaking down when exposed to the suns harmful rays. All seams are double sewn with UV treated polypropylene thread and the elastic in the top is sewn to the bag all the way around so that it cannot come loose and become a hazzard to your animals. When not in use,the Big Bale buddy should be shaken clean and then folded/rolled and stored in the convenient storage case provided. If desired, it can be wiped clean with a damp sponge or washed off with a garden hose and hung to dry. Any wet dirt or manure that sticks to the Big Bale Buddy will simply fall off when it dries or will fall off after a few shakes. Roll or transport your round bale to where you want to feed it. Stand the bale on a flat end. Remove the string or binding. Hook the elastic opening on one side of the top of the bale and then continue around, hooking it over and tugging it down towards the ground until the Big Bale Buddy completely covers the hay bale like a hat. Now flip the round bale over until it is standing on its other end. Pull the elastic opening up and over the edge all the way around. Your round bale is now ready to feed. Alternatively you can put the Big Bale Buddy on your round bale before moving it to your feeding site. If you are feeding smaller animals or wish to provide more access to the bale, fold down the upper edge of the bag so that the elastic grips the sides of the bale and the upper edge is exposed. As the animals eat the hay the bag collapses around it keeping it contained with very minimal wastage. 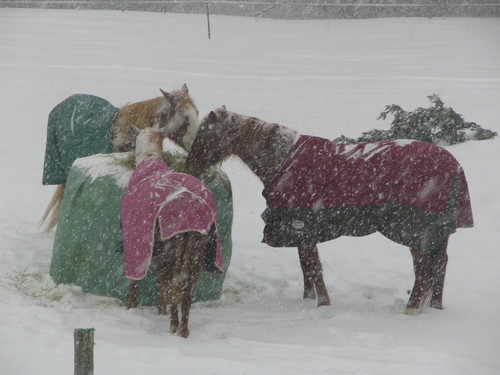 As it nears the end of the bale the animals quickly learn to push the soft folds of polypropylene around with their noses to get the last little bits of hay. When it is empty and ready to re-use, if there is any dirt or manure stuck to it (polypropylene is naturally slippery and repels dirt) pick it up by one edge and give it a few firm shakes to remove. Lay the Big Bale Buddy on its side and smooth it flat then fold the bottom up to meet the center and the elastic down until the outer edges meet the center. Fold both outer edges in to meet the center again. Start at one end and roll tightly until you have a cylinder that easily fits into your carrying bag.